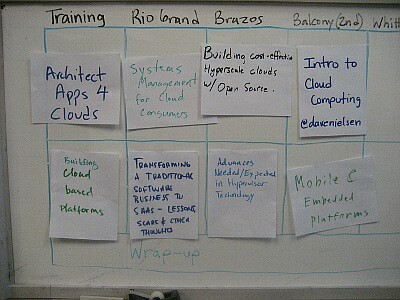 Last Thursday over a 100 cloud enthusiasts gathered for Cloud Camp Austin. 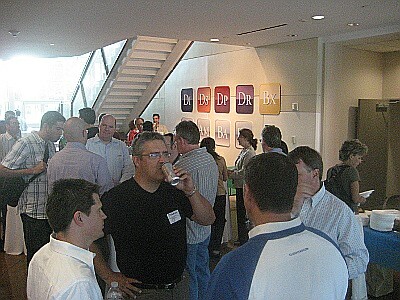 The event was held at Pervasive Software‘s headquarters and kicked off after 5PM with munchies and beer. The event brought in folks all around Austin as well as visitors from exotic areas like upstate New York (the group had been in town for meetings). Pre camp munchies and drinks as folks assemble. Dell was one of the sponsors along with IBM, Microsoft, Twilio, Tropo, Redmonk and our hosts Pervasive . As always, the event was guided along by Mr. cloud camp, Dave Nielsen. Being an “unconference,” after a spontaneously assembled “unpanel” who was called upon to answer questions from the audience, the crowd worked together to decide on the topics that would be discussed. Dave Nielsen explains how this "unpanel" is going to work. All in all a very cool event. The schedule created on the fly by the attendees. Speaking of camps, Dave Nielsen is taking the camp idea and applying it to the world of Big Data. 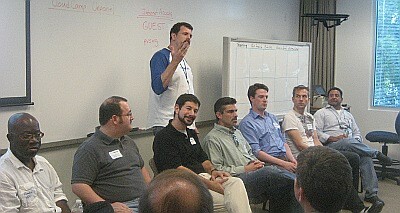 The event, which will be held in Santa Clara on June 28, is imaginatively entitled, Big Data Camp Santa Clara. This unconference is targeted at users of Hadoop and related technologies and is held the night before Hadoop summit 2010. So if you’re in the area and Hadoop/Big Data are your thing, check it out. This entry was posted on Thursday, June 17th, 2010 at 9:55 pm and is filed under Uncategorized. You can follow any responses to this entry through the RSS 2.0 feed. You can leave a response, or trackback from your own site.